John Streif never dribbled a basketball in a Hawkeye game. He never made a tackle or threw a block at Kinnick Stadium. But you could make a strong argument that no one person had a more profound influence on Iowa athletics over the last forty years than John Streif. He will be retiring after four decades of service to the university on Wednesday, so let’s take a look at one of the finest gentlemen ever associated with the University of Iowa. Let’s start with some basics. John Streif hails from the tiny Iowa town of Manchester. 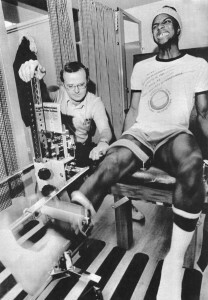 He came to the University of Iowa as a student in 1966 and began to pursue a career in athletic training. He served as an assistant athletics trainer at West Point from 1970-72 and also worked for three summers with the Detroit Lions organization. In 1972, Streif returned to his alma mater and has been an invaluable part of the athletic department ever since. He has served as an assistant athletic trainer since 1972, and in 1980, he also became the school’s travel coordinator. Streif arranged for the team’s accommodations during road trips and helped care for player injuries in his official capacity with the university. But John Streif’s official duties with the university don’t even begin to tell the story. Streif made it his mission to care for Hawkeye athletes in such a way that he gained the admiration of literally everyone he met. For forty years, he selflessly served Hawkeye athletes and coaches, going above and beyond to help them in any way he could. The stories are practically endless. If a player got sick, Streif would come over to their apartment at two in the morning to take care of him. If a player was injured, Streif would be right by his side, rehabbing him back to health. If a former player’s family member was in the hospital, you could count on a phone call or letter or care package from John Streif. He was selfless in everything he did, and as a result, every Hawkeye player or coach who crossed paths with him thought the world of him. His tenure at Iowa spanned decades of players and multiple coaches in every sport. Even athletic directors came and went, but anyone who has been associated with Hawkeye football or basketball at some point over the last forty years has had some interaction with John Streif, and I can practically guarantee it was a very positive one. Streif earned numerous honors from the Hawkeye football and men’s basketball programs, which recognized him for his selflessness. In 1994, several former Hawk basketball players got together and chipped in to create an endowed scholarship at Iowa that would be named in Streif’s honor. Three years later, Streif became the only non-athlete to win the Chris Street Award in the two decades since the award was created. John Streif also received a game ball after Iowa’s Alamo Bowl win in 2001 for his tireless work with an injury-riddled football squad. “Every day John strives to maintain and improve the lives of other individuals while putting himself last. He is the first person to help a fellow staff member, athlete, athletic training student, or acquaintance in any area that needs attention. From covering a different sport or responsibility, to making a reference call for a job; to helping find lodging or a contact in a different location, he is always there to help ease the transition and help out in any way that he can,” Jennie Sertterh, assistant athletic trainer at the University of Iowa, said. That’s John Streif…never wanting or asking for the spotlight, but somehow being dragged into it by a legion of appreciative athletes, coaches, and others who have been powerfully influenced by his generosity. All of this brings me to my own John Streif story. My second book, What It Means to Be a Hawkeye, contains interviews with Hawkeye football players spanning the decades, from the 1930s through 2010. There is also a section in the back dedicated to honorary Hawkeyes who never played for the team but exemplify what it means to be a Hawkeye. When my co-authors and I were conducting our draft to see which former Hawkeyes we got to interview for the book, I jumped on the chance to select John Streif. Everyone I had talked to about the book said that no one was better qualified to talk about the true meaning of being a Hawkeye than Streif. After all, Bump Elliott called him the best hire he ever made (and this is a guy who hired Lute Olson, Hayden Fry, and Dan Gable! ), while Chuck Hartlieb said he’d vote for Streif as the greatest Hawkeye ever. Still, I knew the selection was a long shot. Streif is known to turn down interview requests and leave the attention to the athletes he cares for. But I took a chance anyway. I sent him an e-mail, explaining who I was, what I was doing, and asking if I could talk with him. I made it clear that he could use the opportunity to talk about all the people who influenced him over the years and made a difference in his life. John Streif was gracious enough to agree to be included in the book. Streif and I talked for over an hour, and he probably spent about four or five minutes of that conversation talking about himself. He spent the overwhelming majority of his time gushing about the wonderful people he had met in his life and just how grateful he was to be able to do what he did. It’s hard to describe, but you could hear in his voice the caring compassion that he had for all those he had encountered over his decades of service at the university. John Streif was the real deal. After I sent Streif his complementary copy of the book, he sent me an e-mail. “I so appreciate the excellent presentation you did on my section,” Streif wrote. He then called me a great writer, because I “took nothing and made it into something.” That’s ridiculous, of course…he was a great interview and gave some tremendous insights on how the Hawkeye athletic department is run and what their priorities are. But it’s just another example of his humility to claim that he had nothing to do with how insightful his chapter was. I don’t want to turn this whole thing into a “buy my book!” post. But I said it at the time, and I’ll say it again: interviewing John Streif was probably the highlight of writing What It Means to Be a Hawkeye for me. It really was. After the book was released, we had a number of autograph sessions featuring the people who contributed to the book. Streif politely declined to participate in each one, which was absolutely no surprise. He just didn’t want to take the spotlight off of the players, preferring to remain in the background. Again, that’s par for the course with John Streif. I get asked about ten times a day when I’m going to retire. I tell them: #1, I’m too young; #2, I don’t make enough money to retire; and #3, I lie awake worrying about what I’m going to do when they do retire me when I’m used to doing this seven days a week! I don’t really have anything else in my life, which it’s not supposed to be that way. I guess I’m married to the job, which you’re not supposed to do! But I made it happen just because it’s been enjoyable, positive, and right for me. Retirements for men like John Streif are inevitably bittersweet. On the one hand, you feel happy for someone who contributed so much to the Hawkeyes to be able to relax and enjoy everything he did for the program without the daily stress and pressure that the position brings. On the other hand, it truly is the end of an era. 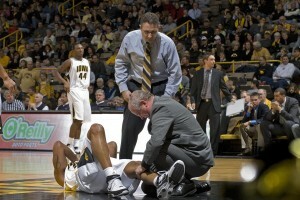 You feel sad that the Iowa program is losing the talents and compassion of this irreplaceable man. Hawkeye athletics will move on, as it always does, but it will never have a better ambassador than John Streif. It has been truly blessed to have benefitted from Streif’s kindness and giving spirit. He’s an example to all of us, a man we should all aspire to emulate in some way every single day. Edited to add: Here’s a great tribute video on John Streif put out by the University of Iowa. Enjoy! There is no greater wisdom than kindness. That is John Strief. I truly honored to know him but most of all I am proud to to call John My friend. Thank you John Streif.